Enjoy the beauty of the countryside and the delight of the nearby town of Congleton makes a great place to escape to - in the countryside yet with all the convenience of being close to the shops and amenities offered by the town of Congleton, not to mention the advantage of being only a few steps from the pub and inviting restaurant. This is a quiet site in a peaceful setting, offering five well-maintained grassy pitches with mains hook-up, water, chemical toilet disposal point and refuse bins. The area is very well kept and planted with a delightful selection of shrubs and flowers, making it more like a private garden than an average site. It is screened and sheltered by mature trees at the back, and looks out over the pub garden to one side, and to open countryside to the other side and to the rear. 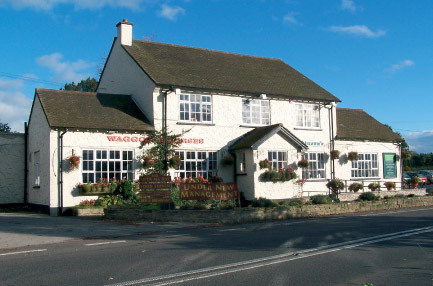 A warm welcome awaits at Waggon and Horses. We hope to see you soon.The pub is located on the A34 Congleton - Alderly Edge road 2 miles north of Congleton.